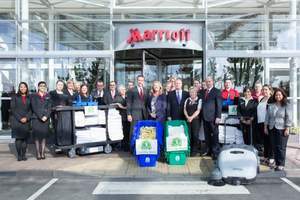 HAYES, UNITED KINGDOM -- (Marketwired) -- 12/18/15 -- Heathrow Airport -- London Heathrow Marriott Hotel pledges its commitment to a greener environment with its announcement as the first hotel in Europe to partner with Clean the World to recycle discarded soap. Clean the World is a global enterprise that repurposes hygiene supplies left behind by hotel guests, to benefit homeless shelters, senior citizens and struggling families around the world. The London property has teamed up with the initiative as part of the hotel's dedication to environmental sustainability. Having been recognised previously by Greenleaders and Green Tourism for its effort to mitigate the impacts of climate change, the hotel is a leader in green practices in the hospitality industry. "Clean The World does a fantastic job of distributing these and other donated products to impoverished people, preventing millions of hygiene-related deaths each year -- we're very pleased to be the first hotel to make a contribution to this cause," said Ron Vos, General Manager of the hotel. "Hundreds of people fly in and out of Heathrow Airport every day and as a result we see hundreds of leisure and business guests come through our doors. If you think about the amount of soap that's discarded by each of these guests and then consider all the people in the world that may not have the luxury of hygiene products, it seems absurd to let it all go to waste." "European hotels have a strong sustainability focus and are looking for new ways to embrace corporate social responsibility. This expansion is significant for us, and we couldn't ask for a better launch partner than the London Heathrow Marriott and Marriott International," Said Shawn Seipler, Clean the World's founder and CEO. As one of the Heathrow's leading hotels, the London Heathrow Marriott is the ideal base, located just half a mile from Heathrow Airport and well connected to London via the Heathrow Express. Offering guests 'Park Here, Fly There' packages for both business and leisure and access to the Hoppa Bus, Heathrow Airport's shuttle service, this hotel is the perfect resting place. The 393 comfortable, spacious rooms offer high speed internet access as well as the Marriott luxury bedding. Guests can also benefit from a quiet night's sleep in the soundproofed rooms, complete with in-room laptop safes for added convenience. The perfect destination for a meeting or large event, the 800 square metre innovative Exhibition Area is ideally suited for trade shows, social soirees and exhibitions. Event staff will also be available to help assist guests plan a special day. The recent refurbishment has seen the restaurants and bars undergo an upgrade which has created specific zones in the hotel lobby, all designed to better meet the needs of guests. There are many on-site dining options featuring distinct menus or and relaxation can be found in the fully equipped Leisure Club, complete with indoor swimming pool.